1. Is it safe (in terms of disease risk) for very young pups to attend? We strictly follow up on our vaccination policy: all dogs must be on schedule for their vaccinations. This means that all adult dogs who visit our grounds are fully vaccinated, and that pups have at least 2 of their 3 puppy vaccinations. The puppy course focuses on problem prevention, habituation, character-building and socialisation. We motivate you to keep up with your socialisation schedule so your pup is a happy-go-lucky, bomb-proof dog by the time he starts his obedience class. The most opportune age to achieve this closes around 13 weeks. The American Veterinary Association’s position statement, Dr. Anderson’s open letter to fellow veterinarians and an epidemiological research paper discuss the impact of the predictable behaviour problems due to insufficient early socialisation. If you would like to read more about the ins and outs of the vaccination debate, you can click on this expanded article. You can find the list of diseases against which your dog must be vaccinated to attend our lessons here. 2. Why must my dog be vaccinated? Can’t I provide a titer? Because we want to offer very young pups a safe environment in which to train. Titers are also ultimately more expensive than vaccinations, and have to be repeated before each new class. For details of our reasoning behind our vaccination policy, read this article. 3. Your lessons are relatively expensive, why is that? Our course fees are on the expensive side, but we are definitely not the most expensive in the region (it ranged from 0 to 25 euros/lesson at our last price survey). Individual attention: Small groups with one Head Instructor for group instructions and one Behaviour Coach for one-on-one advice (see question 11 for Behaviour Coaches). Qualified trainers: In contrast to many local schools who are run by volunteers, we insist on paying our trainers. Because dog training is a profession, not a hobby, we want to give you the most qualified professionals. Dedicated training grounds: Clean, safe, fenced off training grounds in the heart of The Hague where the only dogs that are allowed are the school’s. Q4. Can I bring my kids? Provided they are old enough to calmly attend the lesson and not distract the dogs, we welcome kids and even involve them as our ‘little assistants’ every time we can. We even have a dedicated kid-themed class during the puppy course. Q5. Won’t my dog get fat by using treats in training? We only recommend you use high-value treats (ham, etc.) in class. That is because it is harder for most dogs to focus in a group class. For your home practice, we explicitly instruct you to take the training treats out of the dog’s normal daily ration. In other words, you will no longer be feeding your dog’s daily allowance in his dish, but you will deliver some of it through training. Q6. Won’t the dogs get spoiled with positive training methods? We focus a lot on boundaries and clear rules. Our obedience class specifically teaches dogs to be well-behaved family dogs. Refusing to use intimidation does not mean being lenient dog parents. We also found that a dog who trusts you is more reliable and less likely to be aggressive. And our aim is not to produce an army of robot-dogs but well-adjusted family members. Q7. Why don’t you talk about dominance more? Because, based on years of research, we find the pack theory largely irrelevant to explain dog disobedience. 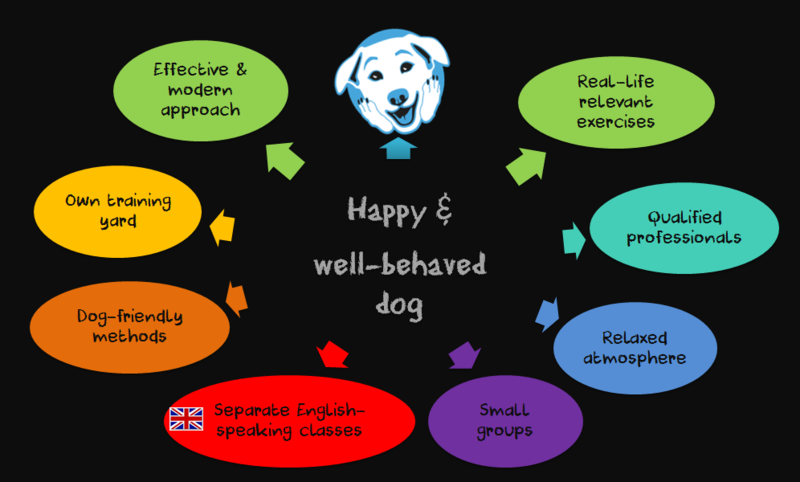 We address each dog and owner as an individual, and our behaviour coach is trained to troubleshoot the frequently occuring little challenges in class by looking at the dog’s underlying motivation on a case-by-case basis (too distracted, undertrained, too stressed, etc.) and demonstrating the solution to you. For a behind-the-scenes look at Behaviour Coaching at OhMyDog, read Chad’s article. Q8. What is ‘continuous puppy enrollment’? How does it work? To make sure the puppy class lessons have a life-long effect, we want to teach your pup during his sensitive period. So we operate a cyclical curriculum with our puppy class. No matter when you join us, you will get every lesson on the program. Every lesson is a one-off introduction to a life skill or situation with minimal iteration between classes so we do not have vastly disparate levels between pups in the same group. The puppies’ broad age range and variety of students who start and end the lesson during your program also allows for maximum variety in the types of dogs your pup is exposed to. Q9. Why are English-speaking classes more expensive than Dutch classes? We welcome expats and their dogs in a dedicated, separate, English-spoken group. Lessons there, including central explanations, are given entirely in English. These groups are smaller than our Dutch groups with the same running costs, so we charge a higher fee per dog to keep this service running in The Hague. Q10. Why am I not allowed to bring both my pups to class at the same time? It firstly concerns ‘littermate syndrome’. It is seriously advised not to bring home two pups from the same litter. Littermate syndrome involves pups who are more focused on each other than on your socialization and education attempts. This can result in pups that are insufficiently socialized, which can lead to serious problems as they grow up (like aggression and fear). Should you already have two pups home, we will advise you to follow separate classes with them. We run several puppy classes in parallel so we should be able to accommodate for this. Secondly, regardless of littermate syndrome, every dog needs the undivided attention of his owner during class, and hoping to be able to effectively handle two dogs during class is unrealistic. Q11. What is a ‘behaviour coach’? Every obedience and puppy class is led by two trainers: one head instructor who presents the lesson centrally, and one behaviour coach. The role of the behaviour coach is to give one-on-one tips and guidance during the lesson. The coaches are true guardian angels for our clients whose dogs have a crazy five minutes. The coaches are trained in behavioural first aid, meaning they have a solution ready for most class problems like distraction, excitement, stress, etc. For a behind-the-scenes look at the role, read Chad’s article on Behaviour Coaching. Q12. What do we mean with ‘evidence-based’? ‘evidence-based’ practice is a code of conduct. People who strive to run an evidence-based school pledge to base their advice on solid logic and good evidence. It doesn’t mean we are cold and clinical, but it means we make sure you get reliable, well-researched, rational, effective advice rather than advice based on dogma, tradition, ideology or old wives tales. For more details of our evidence-based approach, you can read this blog post. Q13. Why can’t the pups play freely together? Puppies are terrible teachers of social interactions to each other, as they themselves are inexperienced and clumsy. Relying on pups to ‘raise’ each other is asking for trouble. The only lesson they’re likely to get out of upsupervised play, are bad habits (bullying the other, playing too rough, etc.). We accept puppies from an early age (10 weeks), so they are not fully vaccinated. So we want to avoid unnecessarily close contact between the pups. Dogs who can interact with other dogs on and off become frustrated and uncertain. It is better to give them the clear message: this is a lesson. During the lesson, you focus on your handler, not on the other dogs. Grown-up dogs tend to need personal space around them, particularly when they are on the lead. Most dogs find it stressful to be approached by another dog whilst they are on the lead. This is when most incidents occur at the dog training school, so we enforce a strict 2-meter between the dogs rule so that dogs can feel relaxed, in the knowledge that their personal space won’t be invaded. For the puppy lessons, we do have a special lesson dedicated to interdog play, during which we pick compatible play partners and let them play off-lead, whilst commenting on their social interactions and showing the owners when and how to interrupt play that is getting out of hand, and the difference between healthy rough play and bullying. 14. Why don’t you give lenghtier responses to ‘quick questions’? Because we get a million and a half ‘quick questions’ every week. We see about fifty students per week, in private sessions or through group training. As small business owners, we already work above the standard 40 hour-week (much more). With the best will in the world, there are simply not enough hours in the week for us to answer every single ‘quick question’ at length. We too have a family, hobbies, (and dogs!) who deserve our attention, and we owe it to them to be mindful of our boundaries. We do this work with all our heart and passion, but we too have a mortgage to pay. We are dog professionals, not dog hobbyists. We expect a fair pay for our services (time and advice). We have invested enormously in our (continued) education and in years of experience. We are not giving that away. We really want to help you, so we do try to answer your ‘quick questions’. We do do it really briefly though (but always nicely!). Maybe we’ll send you a link or a standard handout. Or maybe we’ll give you five minutes’ worth of behaviour first aid after a group lesson. Another reason we don’t give ad-hoc advice is that behaviour problems often go much deeper than a quick tip. To tackle your behaviour question in a responsible way, we often need to know a lot of context. That is why we advise for you to book a behaviour advice session if you are experiencing behaviour issues with your dog (see here for more details). Your instructor will be happy to briefly help you out after the group lesson for obedience-type questions. 15. I wrote to you but I still haven’t heard back. Don’t you care about your clients? We do our best to respond to e-mails within two working days. If you haven’t heard from us in that timeframe, then please check your spambox before you chase us. If you still can’t find our mail, then please check whether your question was already answered in the Terms and conditions, the Welcome letter or the FAQ’s. This could be the reason why we did not answer your mail. When we answer these, the student often feels antagonized because, as much as we hate to do it, the answer is still no. This can start a series of recriminatory mails about why we can’t, just for this once, make an exception. Noone wants this situation: not you, not us. It’s a waste of energy that could be better spent doing our job. Life is busy enough as it is for both of us. So save us both time by reading the Terms and conditions thoroughly before you register for a course. It is just one page long. If you don’t like what you read, then, unfortunately, we won’t have the privilege of your patronage. It is a shame, but isn’t it better to know from the get-go that we’re not a match for your expectations? The good news is that 99% of your questions are already answered in the welcome letter, the FAQ’s and in the Terms and conditions. So, if you have a question about our house rules or something similar, save us both time and first check if it is not answered in one of these documents. 16. Why do you have such and such a Term/Condition in place? Are you mean? Mean? No. We’re actually a lot of fun when you get to know us. We love giving the lessons and there’s always laugh and banter in our consultations and group lessons. We actually pride ourselves in the relaxed, safe and fun atmosphere we create for our clients. But our Terms and conditions are the serious side of business. They cover areas like safety and efficiency. If we are slack on the efficiency front, and allow all sorts of exceptions, we’ll create a huge chaos for ourselves and much confusion for you. And of course, safety is our top priority. So safety and efficiency are the less fun aspects of the business, but they are part-and-parcel of running a professional dog training school. 17. Why do you sometimes not need to see the problem behaviour with your own eyes? Problem behaviour is often triggered when a dog can’t cope with a situation. When the dog gets too stressed, upset and/or scared. This doesn’t fit our vision of animal welare. We are not ready to let an animal suffer just to gather information. Problem behaviour can be self-reinforcing. Every time your dog is exposed to the situation, he will likely react much stronger the next time, and the habit will likely get even more entrenched. 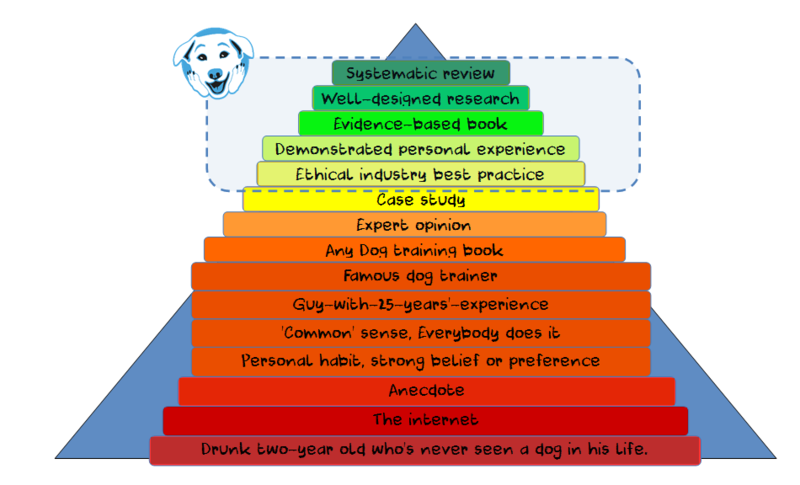 We are there to help you with your dog’s behaviour problem, not make it worse. We can gather really good information from the behaviour form and from our conversation during the consultation. Much better, sometimes, than by observing the dog. This is because the consultation situation is not always representative and the dog won’t respond as he normally does. Sometimes, the dog is so aroused during a consultation that we can’t even hold a conversation. We then ask you to send the dog to a different room, so that we can work uninterrupted. We work with dogs, often dogs who express their problem through aggression, and often dogs who focus their aggression on… guests. Guess who the guest is during a behaviour consultation? That’s right! We are. Not that we don’t like you or anything, but we are not so much into getting bitten, or feeling unsafe in our work. If we estimate the situation to be unsafe, we will ask that the conversation goes on in the absence of the dog. Sometimes, we wait until a significant proportion of the consultation has gone by before calling the dog in. Sometimes, the dog has to stay in another room during the complete consultation. In cases where seeing the problem behaviour would indeed give us valuable information, we ask that you film the behaviour. This provided you can do so in a humane and safe manner.